There’s just something about the northern winter that fires the imagination. Is it the powder-white landscapes, the bustling marketplaces, the winter fashion, or simply the excuse to indulge in some hearty, warming cuisine? Whatever the northern winter means to you, experience its magic for yourself on this unforgettable 12 day tour and rail package of Russia and the Arctic Circle. Explore the iconic cities of Moscow and St. Petersburg, taking time to visit the historic Kremlin, Red Square, and Tsarskoe Selo - a former residence of the Russian imperial family. If you’re lucky enough to visit on the December departure, take some time to wander the magical Christmas markets. Climb aboard the Imperial Russia Train and admire the ever-changing view as you travel to vibrant cities and villages, alongside frozen lakes and on to glistening mountains. While onboard the train, enjoy informative talks on the history and culture of Russia. In the Arctic city of Murmansk, meet the local Saami people and gain insight into their daily lives, plus enjoy an opportunity to seek out the famed northern lights - a true bucket list sight! Package includes return international flights, four nights 4-5 star hotel accommodation, six nights aboard the 4-star Imperial Russia Train and much more! Today depart from either Sydney, Melbourne, *Brisbane, Adelaide or Perth for Moscow, Russia. Fly with airlines such as Etihad Airways, Emirates, British Airways, Singapore Airlines, Cathay Pacific, Virgin Atlantic or Virgin Australia to name a few (subject to availability). Welcome to Moscow and the famous Russian winter! Upon arrival, you will be met at the airport and transferred to your hotel. The remainder of the day is free at leisure. After breakfast, depart for a scenic drive through Moscow's main streets. After a lunch break, the guided walking tour takes you inside the former residence of the Russian Tsars, the Kremlin. See the famous Tsar Cannon, the 16th century Tsar Bell, and Cathedral Square, home to three of Moscow’s most elaborate cathedrals. If you decide to travel on the Christmas departure date, sun down presents a great photo opportunity of the Red Square in winter and New Year decorations, which rate among the most beautiful in the world. Enjoy your dinner at a local restaurant and drive back to the hotel. In the morning, leave the city centre for a visit to Kolomenskoe, a famous open air museum home to a marvellous wooden palace, which once served as a summer residence of grand dukes and the Russian Tsars. Discover rich architectural heritage created by the finest Russian artisans. This beautiful palace is comprised of a large number of buildings connected by passageways. Make the most of the Russian winter with outdoor activities and a traditional ceremony of tea with pancakes. In the afternoon, spend some time walking along the Arbat Street, famous for its souvenir stalls, to feel the vibe of the city. In the evening enjoy dinner at a restaurant, before boarding the Imperial Russia Train for your Arctic Circle adventure. Arrive today in St. Petersburg, often referred to as the Northern Venice; a city brimming with historical monuments, marvellous palaces and beautiful bridges. After breakfast, visit the Peter-Paul-Fortress and pay tribute to the Romanov royal family in the Russian Orthodox Peter-Paul-Cathedral. St. Isaac’s Cathedral, one of the biggest domed buildings in the world, is not just an architectural masterpiece; it comprises innovative and unique engineering ideas of the 19th century. After lunch drive towards Tsarskoe Selo, a former Russian residence of the imperial family, where you will visit Catherine Palace - home to the famous Amber Room. Later in the day, stroll along colourful boulevards; enjoy the city Christmas/winter market (Christmas departure only) or relax in one of the numerous cafes. After a dinner accompanied by gypsy songs and guitar, drive through the illuminated St. Petersburg. Board your train to continue your journey to the Arctic Circle! Today arrive in Petrozavodsk, capital city of the Republic of Karelia. The native Karels and Veps who reside here have preserved their unique culture and traditions. Visit the village of Kinerma to learn the history of the ancient Karelian settlement of 16th century. A local family will host and invite you for a traditional tea with Karelian pies. Drive back to provincial town of Petrozavodsk, the most Soviet of the journey, and enjoy the concert of the local folk group “Kantele”. Tonight, dinner is offered on-board the train. Afterwards enjoy a Russian vodka tasting. Today your train will cross into the Arctic Circle as it makes its way through the Kola Peninsula. Enjoy your morning at leisure, admiring the changing scenery and beautiful landscapes of the Khibiny Mountains. Shortly before lunch, you arrive in Murmansk, the most northern point of the trip. For the next two days you will be lodging in a city hotel. This fascinating town started as a tiny settlement and Arctic trading post. Thanks to the influence of the Gulf Stream, the port is ice-free year round. 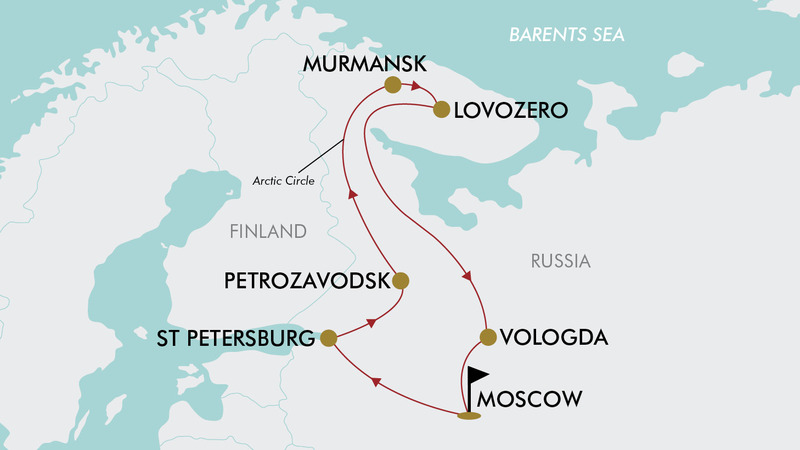 Depart for a city tour taking in major attractions such as the nuclear icebreaker Lenin, and World War II memorials. Later today, enjoy time at the hotel or explore on the surrounding neighbourhood. Tonight, visit a beautifully decorated hotel restaurant and enjoy a festive dinner and colourful show. There is also the possibility of witnessing the famed Northern Lights. Enjoy breakfast at the hotel restaurant. Later this morning, drive to the village of Lovozero, the centre of the cultural life of the Saami - the native people of the Kola Peninsula. Enjoy a lunch with some Saami locals, who will enlighten you on their lifestyle, life in tundra, reindeer herding and hunting. Walk around the village or on the frozen lake to capture the winter landscapes of Arctic winter, or ride a reindeer sled! Around dinner time, arrive in Murmansk and enjoy a relaxed evening. Tonight you will have another chance to witness the Northern Lights. After breakfast at the hotel, board the Imperial Russia Train and travel towards Vologda. Today relax and enjoy the onboard features of the train and the winter scenery. You might want to attend one of the interesting lectures or programmes onboard. In the morning arrive in Vologda, a city with significant historical and cultural heritage. The city is rich in historical sights. The Kremlin Square, where Russian Tsar Ivan the Terrible once walked, is located in the centre of the city. Emperor Peter the Great also used to visit the city frequently. Among artisans, this city is well known for its delicate and exquisite laces. Stroll along the Kremlin grounds and listen to the history of this city, and spot some of the remaining wooden houses with carved window frames that are very much like the laces. Try your hand at painting gingerbread in a workshop and take it with you as a memory of Vologda. In the evening, re-board the Imperial Russia Train to celebrate the farewell dinner. In the morning arrive back in Moscow and be be transferred to the airport for your return flight back to Australia. Travel offer is valid for travel on selected dates until the 13th of February 2020. Please note: dates/months with a * incur a flight high season surcharge of $600 per person. - Moscow (Pre/Post Tour): $465 per room. Land: Double or Twin Bedding (subject to availability). - Visa fees and requirements (A visa for Russia is a strict requirement if travelling on an Australian passport). During winter season in Russia temperatures outside may go down to -25°C. The cold is more severe in St. Petersburg & Petrzavodsk as it is humid due to their location in the immediate vicinity of the Baltic Sea & The Lake Onega. The town of Murmansk is known for milder climate since influenced by the Gulfstream. Please note temperatures in the evening can be even lower, so we recommend you to have some warm clothes in your luggage. A bar car is included in the train formation, which is open all day and through the evening & until the last passenger retires. Smoking is not permitted in the bar area. All drinks are for extra charge. We recommend that you take with you any spare camera batteries that you may require for your trip. Travellers cheques are almost impossible to use outside of Moscow and the large hotels and we advise against bringing them. It is therefore necessary to bring sufficient cash to cover all likely souvenir purchases and additional personal items on the tour. ATM machines dispensing Russian Rubles now exist in nearly all the cities along our route. ​ ​​​​​​Only Russian Rubles are accepted onboard. There will be a doctor on board the train throughout the journey. If you need any regular medication you must bring sufficient to last the duration of the trip. You should also bring a copy of your prescription. Russian medical services are very efficient for foreigners – but this should in no way be considered an alternative to full medical insurance cover. The railways have their own hospitals along the route and your Tour Manager will assist if necessary. On and off the train dress is casual. In the evening we suggest smart casual. Please avoid wearing short clothes during the visits to churches, even if the weather is warm. If not, you will not be allowed to visit inside some churches. Please remember to bring appropriate headgear. Women are required to cover their hair with a headscarf or shawl in Russia’s orthodox churches. Men must not wear short trousers inside the church. Sockets in hotels and on the train use a standard European 2-pin style adapter, 220 V in hotels. Each train car has 110 V (dc) and 220 V (ac) sockets suitable for recharging video batteries and shaving. All food is included (except for dinner on the arrival day) and three meals per day will be provided. A generous allowance of wine, beer or soft drinks is available in the bar car for extra charge. Tea, coffee and mineral water are available from your carriage attendant throughout the tour free of charge. Unfortunately, for security reasons we no longer accept credit card payments on board the train, so any expenses should be settled in cash, either as you go or at the end of the tour. Tipping is at your discretion. Please remember to bring with you, either the original or a copy of your travel insurance policy, stating clearly the company, policy number and 24 hour medical emergency telephone number. It is very important that we have all insurance and emergency contact details prior to departure, so please make sure you complete and return the information request forms as soon as possible. There is no Wi-Fi capability on the train. This Service is chargeable per item, available on the train, and operates from car attendants. We do not recommend to drink tap water on the train. Small bottle of water is daily available in your cabin, during meals and tours. Extra bottled water can be provided by your car attendant any time upon request. As it is not running water onboard and the quantity is limited, please be wise having a shower on the train for your and other travelers convenience. Water in First Class Plus and First Class showers needs some time to heat before it can be used by the next customer. Please keep luggage to a minimum, as there is limited storage space inside the cabin for luggage storage & oversized luggage maybe difficult to stow. We strongly recommend using the soft type of suitcase, as it is easier to fit in the cabin. Soft-topped luggage is easier to store. Clients can have assistance to store their luggage. A full passport with at least 6 months validity remaining on entry into Russia is required for the tour. We strongly recommend taking spare passport photographs and a photocopy of the personal details pages of your passport with you. Keep your passport with you at all times. Keep your duplicate copies separately, preferably in your luggage. Each car has two car attendants, one of whom is always on duty. Smoking is not permitted anywhere on the train except the last sleeping cars end vestibule and on platforms during station stops. Smoking is also not permitted on buses during the city tours, airport transfers and during group meals at restaurants. Consists of 8 passenger compartments with 2 lower berths in each. They are equipped with a table and LCD TV set. In compartment 9 there is a shower booth with a washbowl. Two water closets: at the beginning and the end of the car. The air conditioning system is general, with an option of additional temperature control in each compartment. Consists of 8 passenger compartments with 2 berths in each - one upper and one lower. All compartments are equipped with a table with an armchair. Between compartments, there are four rooms with washbowls and shower cans. In compartment 9 there is a room for storing luggage. Two water closets: at the beginning and the end of the car. The air conditioning system is general, with an option of additional temperature control in each compartment. Most cars are equipped with LCD TV sets. This type of car contains 6 compartments. There are two berths in every compartment: a sofa that transforms into a semi-double bed - 120cm wide, and the upper berth with a width of 90cm, a chair and a folding table. All compartments are equipped with a private en-suite bathroom with a washbasin, toilet and wet shower. An individual air conditioner for heating and cooling the cabin. A tourist visa for Russia is a strict requirement for Australian passport holders. - This tour requires a multi-destination visa, which may mean that your passport may need to be submitted for processing for up to three months prior to your tour departure date from Australia. TripADeal will provide you with further information in your Travel Pack.